The theme of the 2017 High-level Political Forum on Sustainable Development is “Eradicatng poverty and promoting prosperity in a changing world”. These are timely issues for countries in Asia and the Pacific to focus on. Overall, the region has made impressive gains in reducing income poverty in recent decades. Nevertheless, too many people across the Asia-Pacific region still confront poverty as part of their daily life. Some 400 million people, almost one in ten, live in extreme income poverty. One in four people in the developing countries of the region are deprived in additional ways that impact their health, education and standard of living and increase the likelihood that all people in the region will not benefit from shared prosperity. As the development context of our region changes, the relationships between and among governments, the public, the private sector and other players are evolving. Relationships between countries are also changing, and there is evidence to suggest that gaps between the poorest countries in the region and middle-income countries may be growing. This report highlights three key entry points for addressing poverty and expanding prosperity in the region: through pro-poor urbanization, effective management of rural–urban transitions with a focus on rural development, and enabling investment in sustainable and equitable infrastructure. Although people in extreme income poverty are more likely to live in rural areas, they are also increasingly found in our cities and peri-urban areas. The provision of high-quality, low-carbon and resilient infrastructure, with emphasis on meeting the last-mile needs of the poorest, will be essential and requires a paradigm shift in planning and design. 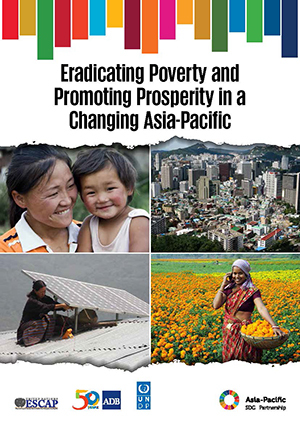 Our analysis is set in the context of long-term trends in the Asia-Pacific region that will shape approaches to poverty alleviation and the prospects for achieving prosperity. These include increasing regional cooperation, growing urbanization, shifting demographics (including ageing in some countries and migration), growing but uneven access to information and communications technology and the rising demand for natural resources. Effective action on eradicating poverty requires tackling the systemic, sociocultural and geographic factors that underpin marginalization, exclusion and lack of protection for human rights. The number of people likely to be in vulnerable employment in the region is now greater than the global average, for example, and women are particularly affected. Measures to ensure that all people can benefit from growth in the region on an equal footing are needed. By analysing the links between these trends and highlighting good practices, this report will provide useful input into regional and global dialogues, including at the upcoming High-level Political Forum on Sustainable Development and its preparatory events. Our three organizations are pleased to partner to support achievement of the 2030 Agenda at all levels of governance in our region, and we hope that this report provides useful insights into opportunities for making progress.